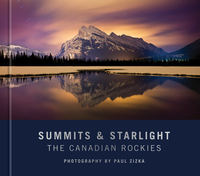 Iconic and classic images of the Canadian Rockies are taken to new heights and completely reimagined in this stunning collection of contemporary photography by Paul Zizka. As a professional photographer and versatile adventurer, Paul has been able to access remarkable backcountry landscapes and dizzying peaks throughout the mountains of western Canada. The result is a collection of images that highlight difficult conditions and hard-to-reach places; alpine sports and backcountry experiences; unusual angles of common mountain subjects; and stars, Northern Lights and dramatic silhouettes. Together, this portfolio represents over 100 of the most breathtaking and unique views of the Rockies to be published in years. Paul’s photography has won numerous awards throughout the world, including the Vancouver International Mountain Film Festival Photography Competition, Landscapes Category, First place (2012); Alpinist magazine Ice Climbing Photography Contest, First place (2011); World Energy Council Energy Photo of the Year Competition, Winning image (2011); Edinburgh Mountain Film Festival Photo Competition, Climbing Category, Winning image (2011); and many more.